Hey Carmen and Waldo - Where the Hell is Mendonoma? You are here: Home / Abalone Bay Love / Hey Carmen and Waldo – Where the Hell is Mendonoma? Hey Carmen and Waldo – Where the Hell is Mendonoma? So what happens when you’re neither fish nor fowl? Or in this case, geographically speaking, neither Mendocino County nor Sonoma County- yet all of the above? Yup that’s what we are, neither fish nor fowl, neither Sonoma County nor Mendocino County….. In much of my blogging and even my Insiders Guide I speak of this mysterious… nay… even mythological location. It’s a place known as Mendonoma. Try as you might you’ll never, ever, find this mythological place anywhere on any Google Map! Imagine if Carmen Sandiego ran away with Waldo to this marvelous no-where land! How in the hell would any child’s parent be able to uncover their whereabouts? Yet…we all know where it is located! As you travel north from San Francisco, you’ll encounter its southernmost border at Sonoma County’s north coast. 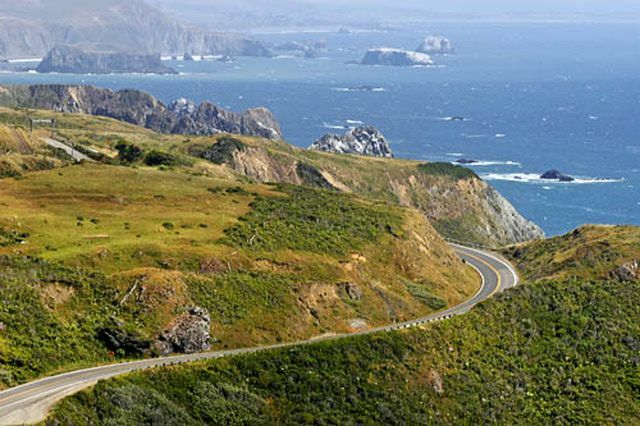 To find the northernmost tip of Mendonoma you’ll travel north to Mendocino County along the two-lane sinuous Coastal Highway 1. The trip takes you along a path with steep cliffs dropping to the Pacific on your left, hairpin curves in the middle, and the coastal mountains on your right covered with the world’s tallest trees-the redwoods at its conclusion. Hence the name adopted for this craggy coastal area: “Mendo” taken from Mendocino and “Noma” from Sonoma – Mendonoma. This trek is a frequent cause for drivers to stop, stretch their legs, and photograph its beauty while waiting for the blood to return to their white knuckles. Some suggest that Jenner-By-The-Sea is the official start of Mendonoma, others may argue it is right after the town as the Coastal Highway begins to lift you up the side of the mountains to Fort Ross. Everyone agrees Mendonoma’s midpoint is at the Gualala River that divides the communities of Gualala and The Sea Ranch. Its northern border is also debated. Some will suggest Manchester at Irish Beach, while others contend it is at the town of Elk, 20 minutes further north. Why You Should Care about Mendonoma? Well, first and foremost, in our humble opinion, for its mid-point – the incredibly wonderful Sea Ranch, the location of our vacation rental, Abalone Bay! But there are two other reasons as well. And we have the data to prove it! Everyone is happy living in the Mendonoma area, most especially in The Sea Ranch, ranked the happiest place in the USA based on census data! Of course- how could it not be with our unique culture of living lightly on the land. And how could we not be happy with our unique architecture, stupendous views, and a general population that’s well off. It is also a population who enjoys sharing their homes with you as we do with Abalone Bay. Based on a ranking of 3,111 counties in the contiguous U.S. for climate and scenery, Sonoma county took spot number 20, while Mendocino took 4th place! The flora and fauna- not to mention the marine animals- including whales migrating past. Rhododendron flowers signal the coming of spring . Why not come up and see me…err… Mendonoma…sometime!